As you might expect from a ski jacket called "bombshell" the Obermeyer Bombshell Ski Jacket brings high fashion to the high country. This faux fur-trimmed jacket isn't just about looks, though; it also packs a high-performance technical package. The 10K HydroBlock® waterproof-breathable fabric is backed by a Thermal Zone Insulation™ system for optimal warmth. Stretch inner cuffs, an adjustable drawcord hem, and Ski Contour™ articulated sleeves offer extra comfort on the slopes. The faux fur around the hood is removable, in case you prefer a more subtle look. "My daughter is 5’6 about 135lbs , her bust size is 36 She is a 28 size in jeans .. not really sure what size in the bombshell jacket to get her . She likes fitted but room for layers underneath "
"I believe a size 8 would work for your daughter. If you know her waist and hip measurements you could reference our size chart to be more certain. Obermeyer does tend to run more relaxed than fitted but the Bombshell does have a shaped fit that flatters most body types. Hope this information helps!" "Is the ceramic color a bright white? Or is it a very fair gray?" "Thank you for your inquiry. The Obermeyer Bombshell Insulated Ski Jacket in the color ceramic is white with a tint of grey. We hope this information helps!" Obermeyer makes functional coats that fit well and are stylish. 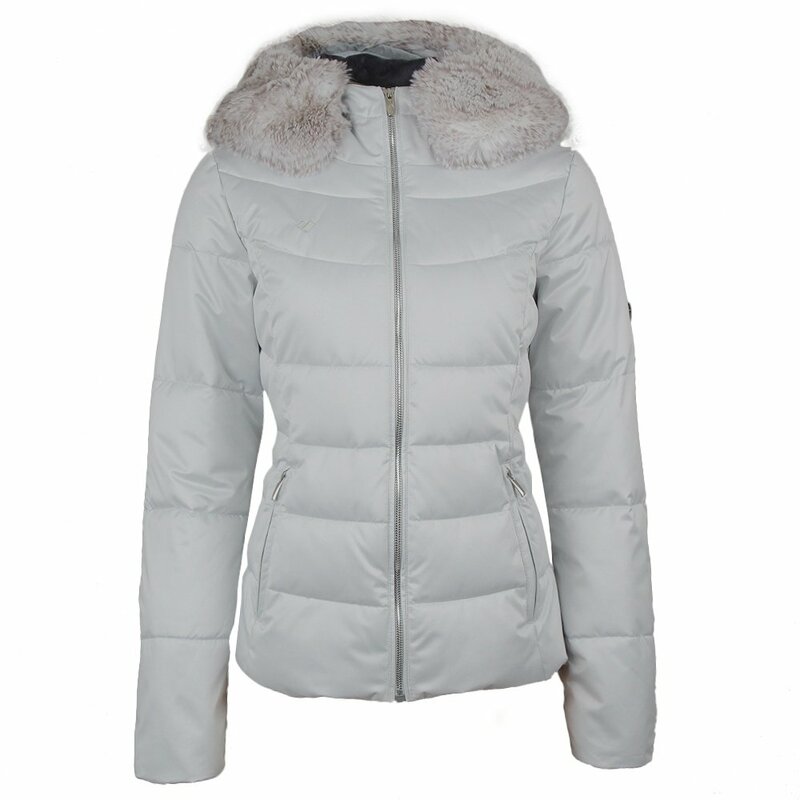 The Bombshell ski jacket is warm, fits well and has the right amount of movement needed for skiing. It has two outer pockets and one inner pocket. This particular model (I believe this is the 2017) does not have an interior powder skirt (as the 2018 model does) and the detachable fur is a different style (2018 model looks more realistic). The fur is fun though and is detachable if you want to change up your look. Most important to me is that this coat comes in petite sizes! The 6p fits like a glove with enough room for a base layer and a mid-layer. Looks great on and off the slopes!